The diagram shows the four interrelated components of comprehensive school health: social and physical environment, teaching and learning, partnerships and services, and healthy school policy. Health and education are interdependent: healthy students are better learners, and better-educated individuals are healthier. Research has shown that a CSH approach is an effective way to tap into that linkage, improving both health and educational outcomes and encouraging healthy behaviours that last a lifetime. In the classroom, CSH facilitates improved academic achievement and can lead to fewer behavioural problems. In the broader school environment, it helps students develop the skills they need to be physically and emotionally healthy for life. 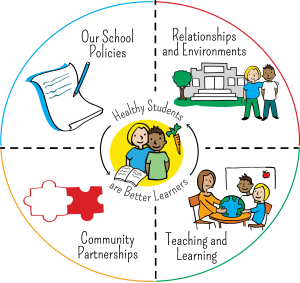 To learn more about comprehensive school health, please visit the Healthy Schools BC Website, where you can learn more about the framework and what it looks like in action. You can also view a short video that explains what CSH is.